I'm Kiah. I am a member of the furry fandom. 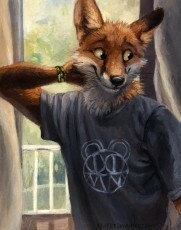 My fursona is a red fox, thus the amazing profile picture by kenket. I enjoy writing LGBT, romance, drama, and thriller stories, and all with anthropomorphic animal characters. A furry is someone who is fascinated by anthropomorphic animals. (Zootopia is the best example). People write and draw their original characters. Anthropomorphic means humanized, so the animals walk on two legs, quite like in Zootopia. Being a furry isn't exclusively a sexual thing. Some members of the fandom write stories with anthro characters and that's all, so I don't like people who assume that. Anyway, I'm posting my story series The White Horizon on here. This includes poems, new short stories, a prequel series to The White Horizon, Joyride, and Kiah+Tacoma. I am a thriller/romance writer from New York and a follower of the furry fandom. It definetly shows off in my writing. I am currently hard at work on two stories: The White Horizon and Kiah+Tacoma. I really love wolves, foxes, coyotes, german shepherds, border collies, and huskies. Please like and become a fan!